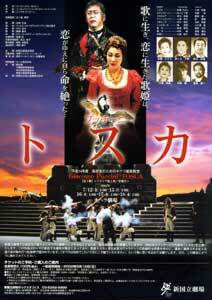 Opera Educational Programme for High School Students (Fiscal 2002)"TOSCA"
Special Cooperation : Rohm Co., Ltd. Supported by : The Yasuda Fire & Marine Insurance Co. Available from Sunday 12 May, 2002 at 10:00am. (¥2,100 for high-school students or under). The New National Theatre Tokyo (NNTT) provides opera classes every year to enable high school students to appreciate the wonderful features of opera. In 2002, NNTT will perform Tosca, one of the most important works of Giacomo Puccini, for the class.